We had amazing weather so I went for a little jog in the morning. I enjoyed the coffee made by one of our dorm mates, Colleen, and appreciated the fridge as I ate some yogurt, granola and fruit. Friday’s class was Monster Rag Dolls with Andrew Dyrdahl. 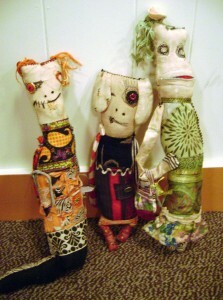 This was a recycled materials, doll sewing class and I was looking forward to using some fabric scraps. I brought my sewing machine, luckily being able to drive I can bring something heavy like that. It was great that Andrew planned ahead and worked with a local sewing shop to have some extra machines on hand to use and then students could even purchase them for a small “show” price. This was very thoughtful of him and the students that had to travel on the plane were quite thankful. Although this project could be made entirely by hand sewing, it was much easier and faster to sew the body and limbs with the machine. When we went around the room doing introductions, there were several fairly inexperienced sewers in the bunch, despite that everyone in the class successfully finished one or MORE dolls within the day. The main ~new~ things that I learned included how to use coffee to stain fabric (the key is using vinegar to help set the color), I discovered a great strap turning tool that I didn’t have (and had to go buy on my way home) and heard some fun thrifting secrets for finding good fabrics and prints. I busted out 3 quick doll bodies before lunch, which was the goal. We needed to coffee stain them before lunch so they had time to dry before stuffing. At home, of course, you can toss them in a dryer, but not at the fort. Luckily, we had sun and old fashioned radiators to speed along the process. After lunch, we stuffed and embellished the dolls and finished the day with a show and tell. I was amazed at the work that came out of this class. Each doll had some personality from the artist but they all looked like they could be in a show together too. That night was vendor night, which I checked out briefly, after a mediocre Thai dinner in town with Jen and Lisa. Then, I finished up my own dolls that evening while hanging out with all the girls. We read silly yearbook entries from some 1920’s vintage year book. They were very odd and seemingly snarky. Someone decided we should all write a yearbook entry for different camp members, so we drew names. But this project seemed to fizzle out by the end of the weekend. I am not sure if it is the unfamiliar beds or the fresh sea air, but I had really weird dreams every night. But I still managed to get enough sleep to be refreshed each morning and ready for more art. This entry was posted in Classes, Fiber Goodness, Pastimes and tagged 2011, artfest on April 14, 2011 by Sheba.